What reports should a helpdesk system have? For the first version, I want to keep the system very simple and easy (as I matter of fact, I’m a die-hard proponent of simplicity; but that is for another post). A Helpdesk system revolves around ‘Case’ (or ticket or problem). 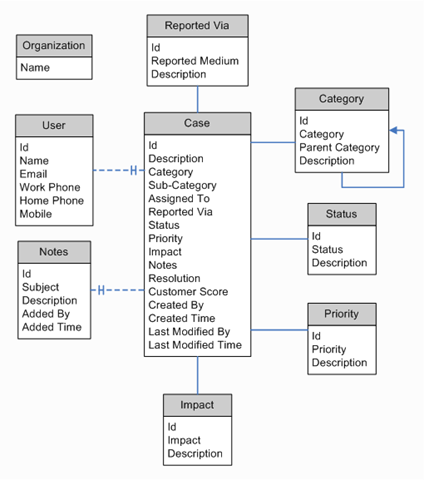 The DB design I’ve shown below supports ‘Case’ and other support data - like Priority and Category. I haven’t included Level, SLA (which will include holidays, business hours) and so on. Those are for next version. These are not exhaustive, but should provide a quick view of reports needed out of a Helpdesk System. As features are added, there will be need for other reports. It should be possible to export these reports as pdf, xls. (By default it will be just html). If you’ve any questions/comments, please feel free to comment.